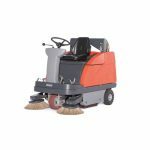 The Sweepmaster 980 R is a compact vacuum sweeping machine for use in both indoor and outdoor areas. 4.5 hours of constant operation is possible keeping your spaces cleaner. The hopper bins are split to make emptying easy. The comfort of this machine is notable alongside the convenience it offers which can also be extended with customisation options. The 980 is the more powerful version of this industrial sweeper and you might find the 900 models a better fit for purpose. Compared to the 900 R, the Sweepmaster 980 R offers more equipment and comfort. More powerful drives, automated filter cleaning system and convenient options increase both deployment possibilities and efficiency. The Take-it-Easy dirt hopper system is fitted as a standard measure, the optional hydraulic high dump feature increases emptying convenience for larger machines in the compact class. In addition to a battery drive or combustion engine, the Sweepmaster 980 R can also be equipped with an LPG system. Fitted with a comfort seat, warning lights, vacuum cleaner (B version) or cab safety roof, for example, it can be tailor-made to fulfil your demands. B900R Battery powered emission free. This variant can be fitted with a vacuum cleaner. P900R Petrol powered for outside use. Models can be customised to suit your needs. Make sure to take a look at the LPG version the 980R.